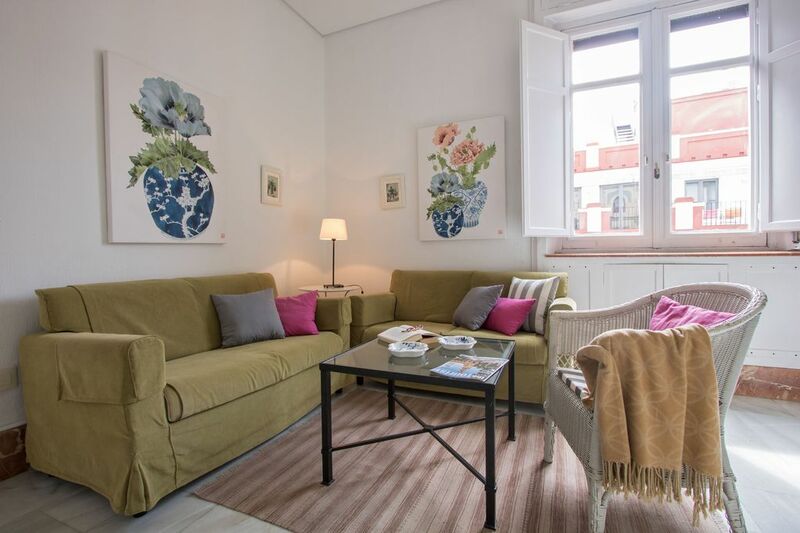 Our apartment "Colonial Terrace” is located on Calle Mateos Gago, this street is most cosmopolitan and lively city with good restaurants and tapas bars. Composed of living room, two bedrooms, kitchen and bathroom separate, and terrace. We can accommodate 4/5 people: one double bed, two single beds, and one extra bed. It is air conditioned, cold and hot. Its independent kitchen is equipped with the necessary for cooking. The apartment is provided with sheets, towels and blankets and free internet connection. The apartment is located in the historical and commercial center of Seville. All the establishments of the commercial zone of Seville composed by the streets Sierpes, Tetuán, Francos and Plaza Nueva are very close to this unique residence. Two of the best restaurants in Seville "Casa Robles" and "Bar Giralda" are very close. One of the attractions of this apartment is its furnished terrace from which you can see the Giralda and the Cathedral with breathtaking views. Given the situation of Mateos Gago Street you can explore the city on foot without needing public transportation: The Guadalquivir River, the Torre del Oro, the Alcázar, the Museo de Bellas Artes, the Palace known as "La Casa de Pilatos" or “Las Dueñas”, and anything that can be visited in Seville, are a few meters from this unique residence. The apartment is located just fifteen minutes by taxi from the airport, and ten minutes from Santa Justa train station. Ask us the prices of taxis. You can also reach the apartment on the airport bus and walk a few minutes to the apartment, from the last stop in the center of Seville. The name of the stop is Torre del Oro. For your daily life in the apartment, you can find supermarkets very close, pharmacies, banks, etc. And a supermarket of a great quality inside the large store "El Corte Inglés" (Calle San Pablo). If you need to leave your car you must let us know and we can reserve a parking space for you. Ask us the price of the parking. The apartment is very well presented, light and spacious. All the main sights and points of interest are within easy walking distance. Maria resolved a problem with the air conditioning quickly and efficiently, and also replaced the toaster! From the front bedroom there's quite a bit of noise from the restaurants below, but you can't hear this at all from the back bedroom. Die Wohnung entspricht zwar der Beschreibung, ist aber total abgewohnt. Bei der Terrasse handelt es sich um eine allgemein zugängliche Dachterrasse, wo u.a. Wäsche aufgehängt wird und ein Küchenabzug sehr unangenehmen Fettgeruch verbreitet. Wir haben sehr oft bei FeWo gemietet, aber diese Wohnung entspricht nicht dem gewohnten Standard. Wir haben die Wohnung nach der ersten Besichtigung wieder verlassen und haben uns eine andere Unterkunft gesucht. Ihr Kommentar ist sehr übertrieben und negativ, und nicht mit den Kommentaren von anderen Gästen, die die maximale Satzzeichen Klasse Wohnung Qualität gegeben haben entsprechen. Vielen Dank. L'appartement a une situation idéal, quasiment en face de la cathédrale et la Giralda, a 2 minutes à pied de l'Alcazar et du barrio Santa Cruz. Il est dans une rue très animée avec pleins de restaurants et de bars. L'appartement est très agréable et lumineux avec tout le confort nécessaire. Une des 2 chambres donnent sur la rue et elle est très bruyante donc si vous avez le sommeil léger, les boules quiès sont obligatoires (sauf si vous fréquentez les bars très tard aussi). C'est vraiment un bon plan. In the heart of Seville, opposite the Plaza Virgen de los Reyes and the Cathedral. The apartment has two bedrooms, lounge, kitchen, bathroom and terrace. Capacity for 4/5 people. Is located on Calle Mateos Gago, at number five. This street is the street most cosmopolitan and vibrant city with good restaurants and tapas bars in it. Two of the best restaurants in Seville 'Casa Robles' and 'Bar Giralda' are very close. The apartment is located in the historic center and shopping area. All shops inthe commercial area of Seville (Sierpes Street, Tetuan, Franks, Plaza Nueva) are very close to this unique residence. From the terrace you can see the Giralda and the cathedral, with stunningviews. You can explore on foot the city without public transportation: The Guadalquivir River, the Torre del Oro, the Alcázar, the Palace of Fine Arts, Palace known as 'The House of Pilate,' and anything that can be visited in Seville. Completely refurbished furniture. It has Internet access. Other Activities: Sightseeing and shopping.